It's several weeks into the school year and I haven't posted anything about my new class yet, but it's all good- they're a great bunch! I have 11 kids and they are loads of fun and full of personality. I'm so lucky that their transition was easy, I didn't even have any criers on the first day! We've been hard at work on identifying their names, identifying the letters in their names, and getting the muscles in their hands strong enough to be ready to start writing their names. Here are some pictures of the name writing activities we've done so far this year. 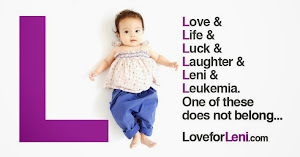 We started learning about names by focusing on the first letter. My students fancied up their first letter with paint and glitter. We made fancy names using some of the materials in the art center. 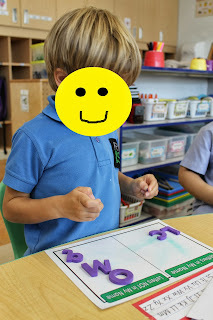 On Deanna Jump's blog I found this cute Wheels on the Bus activity. My kids had a hard time getting through the song without giggling...it was a lot of fun! We worked a lot on name identification too. We used do-a-dot markers to decorate their names. 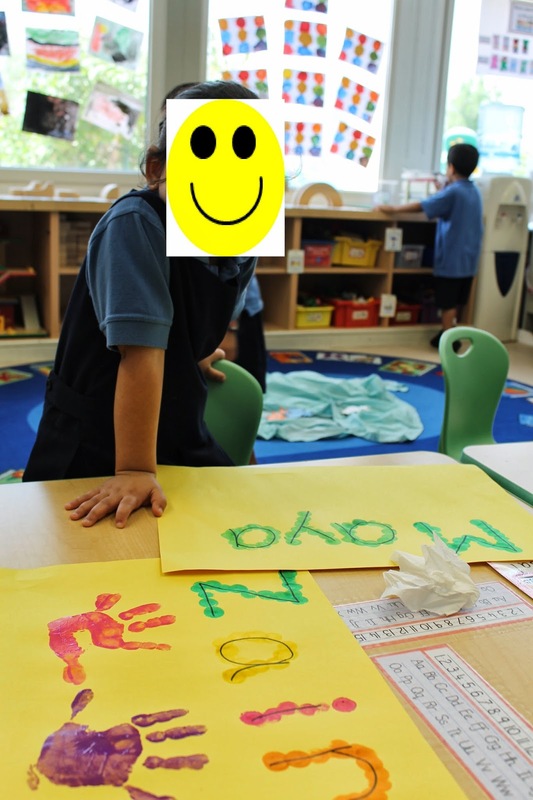 We also put their handprints on the paper too and laminated it so that they can be placemats for playdough this year. Here are my students fishing for their names. I printed out clip art fish on cardstock and wrote the names of each of my students on the fish. 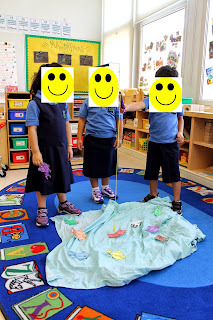 Then I attached a paperclip mouth on each fish and gave students a magnet on a piece of yarn to go fishing with. They loved trying to catch their names! We worked on fine motor skills and letter recognition by making name mosaics. They came out really nicely! We also did the same thing but with pasta. We worked on learning the letters in their names, in order, by putting together name puzzles. 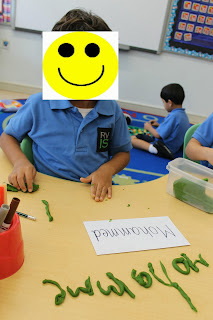 I used a hot glue gun to go over their names so that they could be used to make crayon rubbings. 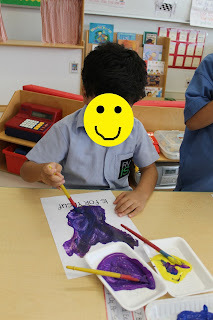 We used alphabet stamps and glitter paint to stamp out their names with the letters in the right order. This is a sorting activity. 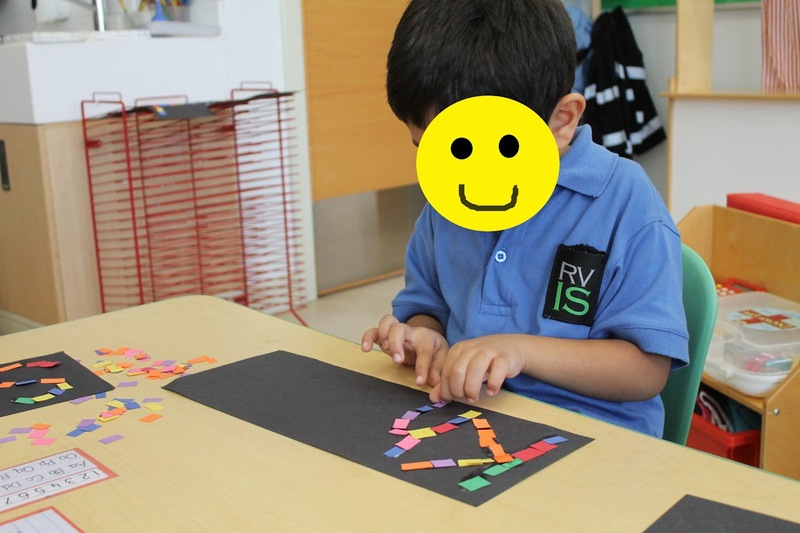 Students were given foam letters and they had to sort them into two columns, letters in my name and letters not in my name. 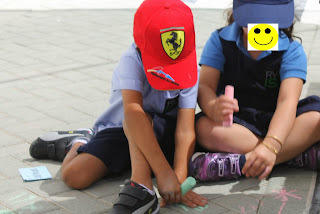 Once we finally started writing their names, we used this disappearing names worksheet where they slowly start writing more and more of their name and we went outside in the HOT, HOT sun and used sidewalk chalk to write the bricks surrounding our early childhood playground. Here's a poem we used throughout our time working on names. If you have any great name activities leave a comment! EXCELLENT activities! Thank you for sharing and I plan to use some of these projects. THANK YOU again! Hello and Welcome! I'm Amy and this blog is a place for me to share some of the fun things going on in my classroom as well as some travel tips and favorite recipes. This is my 9th year of full time teaching. While in university, I spent a semester student teaching at the American International School of Johannesburg in South Africa and I quickly realized that international teaching is a job that perfectly marries my two passions of teaching and traveling. I began my career in New York City public schools, but a few years ago I moved to the lovely island nation of Bahrain, where I am currently teaching Pre-k at an international school. I love my job and can't wait to share with everyone all of fun things happening in my classroom!